Riding snowboard rails is a fun way to test out your skills. Depending on the level snowboarder you are, choose a rail that will challenge your ability and provide you with tons of snowboarding fun. Snowboard rails are an element of snowboarding that will both challenge and entertain you. 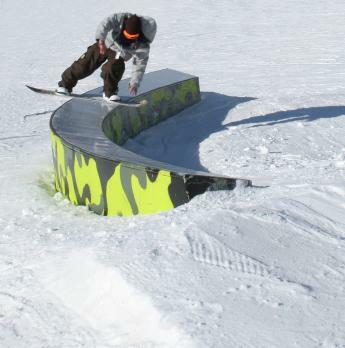 Riding rails is a fun way to spend your snowboarding time while learning new tricks. Rails come in all different types, from those for beginners to those for the most advanced. After a snowboarder masters the boxes, rails are the next step to conquer. They are thinner and slicker than boxes and provide more of a challenge. The ride on the rails can be best described as exhilarating. Rails are made in various shapes and sizes. Beginner snowboard rails are short and low to the ground. The more advanced snowboard rails are much larger and can be high off the ground. The higher rails must be hit from a jump or part of another technique, while the beginner rails can be rode on from the ground. The names for the rails match their various shapes or sizes. For example, a rainbow rail is shaped like a rainbow and a c-rail is designed like the letter c.
Ride On Rail has a ramp that allows the snowboarder to ride on it without hesitation. It is perfect for beginners and is the easiest to master. Flat Rail has a gap in the beginning, then is level to the ground, making it easy to balance on. They are a great rail to learn on but can be fun for boarders of all skills. It can be a challenge to balance on this type of rail without sliding off of it. Down Rail is an angled rail that can be a challenge to balance yourself on. It is a great type of rail to challenge yourself on. Up Rail can be pointed up or away from the mountain. It is usually created as part of another feature instead of a stand-alone type of rail. Kinked Rail has separations in it for a change of direction. The kinks in the rail add a challenge for most snowboarders. Curved Rail has a curved arc and can be designed like the letter c or the letter s. Rainbow rails also fit into the curved rail category. Box Rails are wide and can be easy to learn on. They can be wider than the width of your entire snowboard. Logslides are made by nature. They can be created from fallen trees and are used in the backcountry or in many backyards. These are not only the most challenging but can be dangerous as well since the strength of the rail is sometimes unpredictable. Many resorts have named their rails something that matches that particular resort. Before hitting any rail, it is best to know the type and if you are at the skill level needed to ride it. Always use caution when snowboarding and be aware of the features of the snowboard park you are enjoying. Be sure to wear a helmet when doing tricks and riding the rails to ensure your safety. If you want to have rails in your own backyard, there are many ways to make that possible. Making your own rails can be an easy project for you to tackle yourself. There are also web sites that give you the option to purchase pre-made rails that you can assemble yourself. Riding snowboard rails is a fun and entertaining way to spend the day boarding. They add a challenge to your ride and allow you to challenge your skills. Check out some rails for your next adventure or take a stab at making your own.